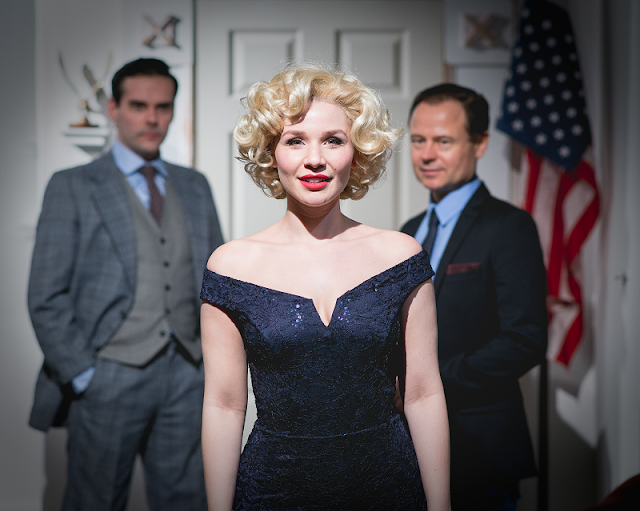 Hot Lips and Cold War bills itself as a sophisticated musical play set in the White House during the 1960s. It tells the story of a young Irish woman named Maria who steals money from a church collection box to pay for passage to America so she can be with her apathetic beau Davey, who works in the White House. Once she arrives, she is recruited by Jackie Kennedy to spy on her husband during his secret rendezvous with Marilyn Monroe. Maria quickly befriends Marvin, a black man who works as a groundskeeper but dreams of being a preacher, but things go sour when an influential prejudice southerner arrives in Washington and accuses Marvin of a crime he didn't commit. It's clear what writer Lizzie Freeborn is aiming to do with Hot Lips and Cold War, as she draws comparisons to the scandals of the 60s and America's current turbulent political climate. However, for all its apt commentary on abuses of power in relation to race and gender, it never quite packs the punch it feels like it should. Right from the beginning, Hot Lips and Cold War is a jumble of themes and ideas, some interesting, others clichéd, and a few downright unbelievable. Despite the somewhat patchy story, the cast is game and energetic, and attempts at impersonations of real life historical figures are, for the most part, impressive. In particular, Freya Tilly as Marilyn Monroe makes a clear distinction between the public Marilyn, who slinks around flashing a fake smile, and the private Marilyn, whose life was much more complicated than her public persona ever let on. She gives a memorable performance of Marilyn’s infamous Happy Birthday Mister President, and it’s a shame that the story seems uninterested in giving Marilyn much to do aside from pop up now and then to seduce JFK and torment his wife. One unusual moment even sees Marilyn emerging from a secret tunnel in the White House grounds, greeting some staff members and then stalking off to find her lover – an unusual narrative choice which calls into question why Jackie needs photographic evidence of the affair, when literally everyone seems to know about it anyway. Sylvie Briggs fairs a little better. With her gorgeously crisp singing voice, she sells Maria as a determined yet morally conflicted individual, and even manages to squeeze some romance out of her love interests (her relationships with both Davey and Marvin feel underdeveloped, which is a real shame given that Adam Small has previously proven himself a worthy leading man in the brilliant new musical Paper Hearts, and Jamal Franklin is charismatic and likeable in his scenes). Lewis Rae is also entertaining as Kenny O'Donnell, one of JFK's closest aids and friends. It’s a role which could have melted into the background, but Rae makes the most of every moment he’s on stage. Ashley Knight gives an equally committed if slightly over the top performance as Jerome Kingsley, the villain of the story. Understandably, at times he seems a little uncomfortable, as his role straddles the borders between panto villain and racist Yosemite Sam impersonator who isn't afraid to say the 'N' word. Twice. (It may be a historically accurate word for a deplorable racist to have said 50 years ago, but even in context it’s a jarring and uncomfortable thing to hear today in a piece of theatre written and performed by 2 white creatives). On a positive note, he does have a rather jaunty musical number, about how the Southern states will not remain loyal to the president if he continues to support integration. Hot Lips and Cold War identifies as a musical play, but there are more than enough musical numbers to categorise it as a musical instead. Freeborn’s songs capture the sound of 60s lounge music well, but the score could perhaps do with a few more stand out numbers. A special mention though must go to the production's musicians, under the musical direction of Oli Rew, who keep the show ticking along nicely. Although in its current iteration Hot Lips and Cold War feels, at times, incoherent and inconsequential, it is far from lost cause. Freeborn’s ambitious storytelling is certainly timely, and astutely identifies the ways in which history repeats itself. The time period is an attractive one, aesthetically, which is reflected in the beautiful costumes by Hal and Ruthie Theatrical Design. It’s also a rough time period politically and socially, and is full of interesting stories which deserve to be told. The production's presentation at London Theatre Workshop will surely allow the creative team to assess what works and what does not, and further workshopping will undoubtedly produce a more slimlined and sophisticated result.